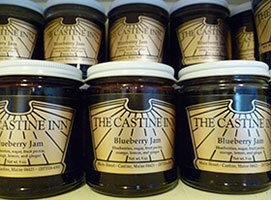 Castine Inn Jam is available for purchase. Relive the memories of your visit at the Castine Inn, a Maine Inn offering quality lodging in historic Castine Maine on the Maine Coast near Acadia National Park and Mount Desert Island. Bring the taste of The Castine Inn home with our locally produced strawberry and blueberry jam. These are the same ones you enjoyed on your stay at the Inn and are a great way to enjoy some of the home grown goodness of Maine. Each jar contains 9 ounces of our delicious jam for only $7.00. Shipping is a flat rate of $12.50 per order (up to 10 jars). Makes a great gift in any season!